For decentralized control applications, the all-new “RAFIX in the Box” housing units give customers maximum freedom to customize the number and type of built-in control components, housing dimensions, and connectors. RAFI provides the compact control units pre-assembled and ready for connection. The powder-coated aluminum die-cast housings are available in standard dimensions of 57 mm or 82 mm width and 100 mm, 150 mm, or 200 mm length. The slim version takes a single row of connectors, whereas the wide version can be equipped in two rows. Customers can choose from the RAFIX 22 FS+ and RAFIX 22 FSR series of control components for their customized assembly. These products accommodate a housing height of just 32 mm due to their low mounting depth. 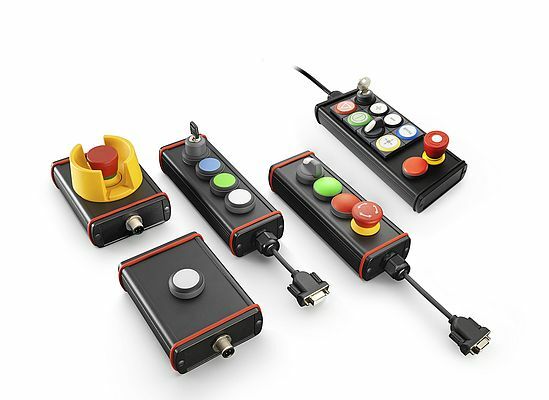 Available actuating elements include illuminated pushbuttons with protruding or flat bezels, selector switches, key switches and mushroom pushbuttons, emergency stop buttons, signal indicators, and potentiometer drives. For use under adverse weather conditions, exposure to severe mechanical stress, or in extremely dirty conditions, RAFI recommends the RAFIX 22 FSR series of heavy-duty control components. Depending on requirements, RAFIX boxes can also be used as hand-held units. These can be fitted with optional magnetic feet to be easily attached to any metal surface whenever they are not in use. RAFIX boxes can also be mounted on walls or 40 mm profiles with accessories such as mounting clamps and brackets. Connectors for the boxes can be configured entirely to customer specifications: All common plug and cable types, lengths, and fittings are available. Thanks to their robust design with a degree of protection up to IP65, effective EMC shielding and high-quality switches and buttons, RAFIX boxes provide excellent reliability and precise switching. With a RAFIX box, customers receive a product that is immediately ready to use, featuring a housing machined exactly to their needs that comes fitted and fully wired with components according to their individual specifications.